Background Nicotine is known as the drug that is responsible for the addicted behaviour of tobacco users, but it has poor reinforcing effects when administered alone. Tobacco product design features enhance abuse liability by (A) optimising the dynamic delivery of nicotine to central nervous system receptors, and affecting smokers’ withdrawal symptoms, mood and behaviour; and (B) effecting conditioned learning, through sensory cues, including aroma, touch and visual stimulation, to create perceptions of pending nicotine reward. This study examines the use of additives called ‘pyrazines’, which may enhance abuse potential, their introduction in ‘lights’ and subsequently in the highly market successful Marlboro Lights (Gold) cigarettes and eventually many major brands. Methods We conducted internal tobacco industry research using online databases in conjunction with published scientific literature research, based on an iterative feedback process. Results Tobacco manufacturers developed the use of a range of compounds, including pyrazines, in order to enhance ‘light’ cigarette products’ acceptance and sales. Pyrazines with chemosensory and pharmacological effects were incorporated in the first ‘full-flavour, low-tar’ product achieving high market success. Such additives may enhance dependence by helping to optimise nicotine delivery and dosing and through cueing and learned behaviour. Conclusions Cigarette additives and ingredients with chemosensory effects that promote addiction by acting synergistically with nicotine, increasing product appeal, easing smoking initiation, discouraging cessation or promoting relapse should be regulated by the US Food and Drug Administration. Current models of tobacco abuse liability could be revised to include more explicit roles with regard to non-nicotine constituents that enhance abuse potential. Tobacco manufacturers modified the design of products by directly adding constituents to cigarettes that stimulate gustatory, tactile and olfactory nerve receptors and create chemosensory effects that could enhance elasticity in nicotine dosing as well as strengthen sensory cueing to optimise the ‘pleasure’ in smoking.38 ,42–51 Pyrazines, a class of chemosensory agents, comprise 15 of the 599 compounds on the list of cigarette ingredients provided by manufacturers to the US Department of Health and Human Services in 1994,52 8 of the compounds on the list of additive ingredients provided by manufacturers to the FDA in 201153 and 10 of the compounds presently listed on cigarette manufacturers’ website as cigarette ingredients”54–56 (box 1). The present study explores tobacco industry research that first identified pyrazines in tobacco smoke and was followed by the introduction of pyrazines in ‘light’ cigarettes and subsequent incorporation into Marlboro Lights and eventually in many other cigarette brands. It further examines their possible role in abuse potential. 56R.J. Reynolds Tobacco Company web site. More than 7 000 000 tobacco industry documents have been disclosed by the major tobacco companies during litigation processes and made public as a result of the Minnesota Tobacco Trial and the Master Settlement Agreement of 1998.57 ,58 We searched online internal tobacco industry document databases housed at Tobacco Documents Online (http://www.tobaccodocuments.org), the British American Tobacco Document Archive (http://bat.library.ucsf.edu) and the Legacy Tobacco Documents Library (http://legacy.library.ucsf.edu). Standard methods used for document analysis have been described in detail elsewhere.59 ,60 Document identification was performed using an index-based word search of titles, authors, recipients and other document characteristics (such as date, document type, original file location), as well as keywords and abstracts. Whenever available, full-text optical character recognition was also used. We used a snowball sampling method to first search the databases using an initial set of key words (eg, pyrazines, flavorant, flavoring, flavor, chemosensory, sensory, low-tar, stimulation, attributes, perception, effects, taste, smoothness and product development) and relevant combinations of these terms, and to generate further search terms from the documents identified. Relevant documents were abstracted and indexed. The resulting document set was surveyed for recurring authors, keywords, codes or project names that would suggest further avenues for retrieval. A number of unique difficulties associated with the use of internal industry documents as a source of scientific information must be considered. Industry research was not generally subjected to careful peer review, and details regarding the experimental methods used and the resulting quality of the data are often unavailable, making it difficult to assess the reliability of the science. In addition, the available documents do not always represent the totality of the internal research that was conducted on a particular topic—as indicated by the existence of many partial reports and memos. Finally, within each given company, the documents are authored by numerous different researchers from a range of departments over tens of years, and so findings are sometimes inconsistent and occasionally even contradictory. Comparisons of the documents reveal real company-to-company differences in approach to the engineering of tobacco product design, a finding that must be taken into account. For these reasons and to inform the findings in internal industry documents, we conducted this research in conjunction with a systematic review of evidence from the current scientific literature indexed in databases including PubMed (http://www.pubmed.gov) and Web of Science (http://thomsonreuters.com/web-of-science) using the same search strategies. 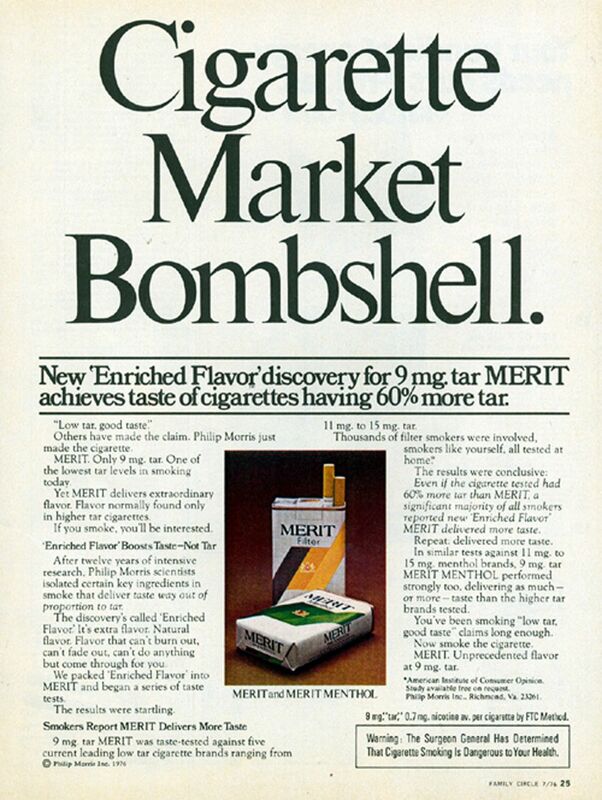 Advertisement for new ‘Enriched Flavor’ MERIT cigarettes (1976). PM called the new flavour formulation ‘Super Juice’, which contained 2,6-dimethyl pyrazine, tetramethyl pyrazine and trimethyl pyrazine as well as acetic acid, cyclotene, maltol, isobutyric acid and 1-methyl indole.66 Reverse engineering and research by British American Tobacco of PM products, MERIT, MERIT Menthol, Marlboro and Marlboro Lights identified at least six pyrazines: 2-methylpyrazine, methylethylpyrazine, dimethylethylpyrazine, 2,3-dimethylpyrazine, 2,6-dimethylpyrazine, trimethylpyrazine and tetramethylpyrazine, and found that pyrazines contribute to the burley flavour, which is a common characteristic of many PM brands (isomers noted only where referenced in document).67 In the USA in the late 1970s, ‘Super Juice’-like compounds were added to Marlboro Lights, which is now called ‘Marlboro Gold’. Ingredients also included essential oils, inorganic acids and other constituents, added to a reconstituted tobacco sheet with diammonium phosphate, which appears to have allowed better control of constituent release.68 Marlboro Lights have since become the leading selling cigarette brand. Graphic representation of the Maillard Browning reaction in the formation of pyrazines. Pyrazine stimulation of olfactory receptors may enhance learned behaviour, either by acting alone or in combination with other sensory modality stimuli.90 ,91 Human responses to chemosensory and olfactory effects that are associated with emotionally significant experiences can become constitutional through neuroplastic changes in the olfactory pathways to the limbic system as well as other areas of the brain associated with hedonic perception.92 ,93 Such events can reinforce smoking through associative learning and become cues for increased hedonic valence of stimuli94 and motivate increased desire or wanting, or even unrestrained consumption. Chemosensory effects such as perceived smoothing and coolness (tactile) are associated with decreased aversion to smoking from the harshness and irritation of initial exposure to nicotine among novice smokers.99 ,100 Similar effects have been described for menthol.84 These effects might be a factor in smokers switching to ‘low-tar’ brands as an alternative to quitting smoking, going beyond the cognitive perception of reduced disease risk, to the emotive, physical perception that the smoke is ‘smoother’ and thus less harmful. Further, an RJR 1986 brand report describes the company's targeting of males 18–24 years of age by increasing the smoothness and masking the harshness and irritation of tobacco smoke.101 The observed effects of pyrazines on secondhand smoke (SHS) demonstrate that these compounds were also used to reduce the irritation from SHS among non-smokers.102 If non-smokers exposed to SHS perceive less risk due to lower irritation, without an actual reduction in their toxic constituents and effects, pyrazines might be classifiable as ‘potentially hazardous constituents’ under Section 904 of the Family Smoking and Tobacco Prevention Act of 2009 (FSPTCA). The FSPTCA explicitly bans the use of additives in cigarettes that are ‘characterising flavours’, which as defined by FDA food regulations are those that have taste or gustatory (eg, sweet, salt, sour, bitter) effects and are used in labelling, such as ‘chocolate’ flavoured cigarettes. However, a ‘characterising’ gustatory flavour may have relatively little significance if the major effect of an additive is on the olfactory and tactile receptors. British-American Tobacco concluded from research conducted that the prime sensorial experiences of smoking are associated with chemosensory flavour (odours, aroma) and irritation (tactile) sensations, whereas the gustatory qualities were found to be relatively less important for product attractiveness and appeal.104 Flavour ingredients such as cocoa, licorice or vanilla have remained present in major cigarettes brands since prior to the ban's implementation,54 which raises questions about the efficacy of the ban on the use of flavour ingredients and their consequential effects. When defining ‘characterising’ flavours for combusted tobacco products, the FDA Center for Tobacco Products should consider the distinction between flavours whose effects are primarily gustatory and flavours with olfactory or tactile effects. Experimental use of electronic nicotine delivery systems (ENDS) has been rapidly increasing among teens.105–108 Not surprisingly, the liquid flavour fluid formulations of ENDS include pyrazine additives such as 2,3,5,6-tetramethyl-pyrazine (0.9–1.5%), 2,3,5-trimethylpyrazine (0.3–4.5%) and acetylpyrazine (0.4–1.6%),109 which also appear on the aforementioned lists of cigarette additives. Taken together, pyrazines appear to increase product appeal and make it easier for non-smokers to initiate smoking, more difficult for current smokers to quit, much easier for former smokers to relapse into smoking, and may mask the risks of both active and passive smoking. The present findings should be interpreted in the context of the unique challenges of tobacco document research and known limitations with respect to documents availability. Access to the most recent industry documents is limited; use of terminology, practices and methods varies between companies and over time; and industry documents pertaining to pyrazines since the 1990s are largely unknown. Research conducted by industry is for business and commercial purposes, has not been peer reviewed and cannot be considered to be conclusive, absent independent confirmation. Therefore, a larger body of evidence should be considered with respect to the implications of these findings for public health and policy. Future studies could focus on understanding the pivotal roles of pyrazines, their derivatives and other ‘flavour’ additives that stimulate neural receptors in neurobiological pathways, and actions in areas of the brain that affect abuse liability. Research could be conducted to examine the physiological and pharmacological actions of pyrazines and provide insight into the transduction mechanisms, receptor structure and chemical structure-activity relationships. Electrophysiological responses to chemosensory stimulants using radioactive labelled pyrazines and functional MRI and EEG could highlight specific areas of the brain stimulated by pyrazines. The tobacco industry has long been interested in maximising the attractiveness, appeal, ease-of-use and low health-risk perceptions of tobacco products in a highly competitive and unregulated market in order to increase sales and market share.29 ,36–38 To that end, manufacturers have researched and designed cigarettes with constituents that act independently of as well as synergistically with nicotine and may enhance abuse potential. The findings that are provided by these and other reports may help enable regulators such as the FDA, Health Canada, European Union and the WHO to develop standards to reverse these actions and reduce the addictiveness of tobacco products. Nicotine is known as the drug that is responsible for the addicted behaviour of tobacco users, but it has been argued that non-nicotine factors are also essential to account for the intense addictive properties of tobacco smoking and high relapse rates among smokers after quitting. This study reveals how some tobacco manufacturers innovated with the use of pyrazines as additives. Pyrazines have been reported to have chemosensory and pharmacological properties and appear to be widely used now in cigarette brands. Pyrazines may help to optimise nicotine delivery and dosing, and promote addiction through cueing, learned behaviour and/or direct effects. US. Department of Health and Human Services. The health consequences of smoking: 50 years of progress. A Report of the Surgeon General. Atlanta, GA: U.S. Department of Health and Human Services, Centers for Disease Control and Prevention, National Center for Chronic Disease Prevention and Health Promotion, Office on Smoking and Health, 2014. Printed with corrections, January 2014. Food and Drug Administration. Regulations restricting the sale and distribution of cigarettes and smokeless tobacco products to protect children and adolescents; proposed rule analysis regarding FDA's jurisdiction over nicotine-containing cigarettes and smokeless tobacco products; notice. Fed Regist 1995;60:41314–792. WHO Study Group on Tobacco Product Regulation. Report on the Scientific Basis of Tobacco Product Regulation: fourth report of a WHO study group. WHO Technical Report Series; No. 967. http://www.who.int/tobacco/publications/prod_regulation/trs_967/en/index.html (accessed 2 Jan 2013). U.S. Department of Health and Human Services. The health consequences of smoking: nicotine addiction. A report of the Surgeon General. Rockville, MD: Public Health Service, 1988.
. Smokers do not self-administer nicotine other than in tobacco: a reply to Perkins (2004). Psychopharmacology (Berl) 2004;175:259–61. Oslo monograph: Advancing knowledge on regulating tobacco products. International Conference on Advancing Knowledge on Regulating Tobacco Products, 9-11 February 2000, Oslo, Norway. National Cancer Institute. Risks associated with smoking cigarettes with low machine-measured yields of tar and nicotine. Smoking and Tobacco Control Monograph No. 13. Bethesda, MD: U.S. Department of Health and Human Services, National Institute of Health, National Cancer Institute, NIH Pub. No. 02-5074, 2001.
. Free nicotine: its implications on smoke impact. 22 October, 1979. Bates Number 542001985/1996. National Cancer Institute. Smoking and tobacco control monograph 7. Bethesda, MD: U.S. Department of Health and Human Services, National Institutes of Health, National Cancer Institute, 1996. The FTC Cigarette Test Method for Determining Tar, Nicotine, and Carbon Monoxide Yields of U.S. Cigarettes. NIH Pub.No.96-4028. R.J. Reynolds Tobacco Company. Cigarette ingredients: a complete list and background. Winston-Salem, NC: R.J. Reynolds Tobacco Company, 1994. Bates number 511981022/1046. Letter. U.S. Food and Drug Administration, Center for Tobacco Products. Freedom of Information Act Office to GN Connolly. November 12, 2011. RE: FOIA Requests under Section 904, Family Smoking Prevention and Tobacco Control Act. Philip Morris USA. http://www.philipmorrisusa.com/en/cms/Products/cigarettes/Ingredients/Ingredients_By_Brand/default.aspx (accessed 1 Apr 2014). Lorillard, Inc. http://www.lorillard.com/wp-content/uploads/2012/02/Lorillard_IngredientList_March-2012.pdf (accessed 12 Nov 2013). R.J. Reynolds Tobacco Company. http://www.rjrt.com/ingredients.aspx (accessed 12 Nov 2013). Master Settlement Agreement. (1998) http://www.naag.org/backpages/naag/tobacco/msa/msa-pdf (accessed 18 Jun 2013). U.S Department of Health, Education, and Welfare. Smoking and health: report of the Advisory Committee of the Surgeon General of the Public Health Service. Washington DC: US Government Printing Office, 1964. Philip Morris. Breakthrough of the high taste, low tar cigarette: a case history of innovation. Philip Morris, Inc., 1980. Bates number. /6216.
. Basic flavor investigation low tar/high flavor literature review special. Philip Morris, Inc., 1990. Bates number 2046741788/1830. American Institute of Consumer Opinion. The consumer testing of Merit cigarettes. Philip Morris, Inc., 1976. Bates number 2015010659/0669. Trinkets and Trash. http://www.trinketsandtrash.org/detail.php?artifactid=9771&page=1. Accessed April 16, 2015.
. Super juice constituents. Philip Morris, Inc., 1975. Bates number 1003720260.
. Alkylpyrazine levels in Philip Morris brands: report no RD 1509 restricted. British-American Tobacco Company Limited, 1977. Bates number 105467378-05467412.
. Brown & Williamson. Root technology; a handbook for leaf blenders and product developers. 1991. Bates 682439026/9083.
. The Maillard reaction: chemistry, biochemistry, implications. UK: RSC Publishing, 2005. Philip Morris. Recent advances in tobacco science. Volume 7 tobacco leaf chemistry: its origin, understanding and current trends. Philip Morris, 1981. Bates number: 2060456904. R. J. Reynolds Medicine Sir. Tobacco smoke reduces the delivery of mainstream total particulate matter and, of course, its component parts, “tar” and nicotine. RJ Reynolds, 1989. Bates number 509896141.
. Tobacco flavoring for smoking products. Winston-Salem, NC: R.J. Reynolds Tobacco Company, 1972.
; Alapharetta Aromatics. Pyrazines and other flavors; pyrazines-their properties, reported uses, and technical information. RJ Reynolds, 1980. Bates number 510245748/510245754.
. Tobacco flavoring for smoking products. Winston-Salem: R.J. Reynolds Tobacco Company, 1972.
. The chemical components of tobacco and tobacco smoke. 2nd edn. Boca-Raton: CRC Press, 2013.
. Chemosensation in C. elegans. Vol 25. WormBook, 2006:1–29.
. 2307 Basic flavor investigation low tar. Research Collection, 1990. Bates number 2050878148-2050878190.
. Modeling. Philip Morris, 1990. Bates number 2024847429/7627.
. Chemical senses research a research and development perspective. Research Collection, 1990. Bates number 2024847429-2024847627. R. J. Reynolds. Taste & olfaction. RJ Reynolds, 1987. Bates number 509859364/9400.
. 2305 Flavor development 781200—791200 flavor development. Philip Morris, Inc, 1979. Bates number 1000379766/979. British American Tobacco. Reduction of tobacco smoke irritation by use of potential ameliorants. 1994. Bates number 403682358-403682377.
. Mid year report 1986 (860000).Research Collection, 1986. Bates number 512829089-512829241.
. Influence of additive and flavorants on ETS irritancy. RJ Reynolds, 1988. Bates number 508857534/7536. BATCo. Product technology: brand development programme. 4 October 1990. Bates number 400346673-/6788. Centers for Disease Control and Prevention (CDC). Notes from the field. MMWR Morb Mortal Wkly Rep 2013;62:729–30.
. Monitoring the Future national results on adolescent drug use: Overview of key findings, 2014. Ann Arbor, Mich.: Institute for Social Research, the University of Michigan, 2015. V2 Cigs. Flavor Profile v.1.2 Revised August 30, 2011. http://www.ciggutmaningen.se/download/v2-cigs-content-refillhylsor.pdf (accessed 27 Jul 2014). Disclaimer This research was conducted by the authors while at the Harvard School of Public Health. Dr Connolly is now Professor of Research at Northeastern University. Contributors GNC had primary responsibility for the conception of the research. HRA, ITA and GNC contributed to the design of the research. HRA and ITA conducted the research and prepared drafts of the manuscript. GNC contributed to the editing of the manuscript drafts, and HRA prepared the final manuscript. Funding This research was supported by the National Cancer Institute grant numbers 3R01 CA125224-03s1rev++ and 2R01 CA087477-09A2. Competing interests ITA initiated his work on the reported research while affiliated with the Center for Global Tobacco Control at Harvard School of Public Health. He is currently affiliated with the Centers for Disease Control and Prevention’s Office on Smoking and Health.